“A Long Road for a Grand Boulevard – Part 2” illustrates how thoughtful design can improve Grand Boulevard for all users. This post highlights a few refinements of this concept from the cyclist perspective. I agree with the overall premise of protected bike lanes and the approach to phasing from paint to full infrastructure. After all, protected bike lanes are safer and more comfortable for cyclists of all abilities. The following are a few additional considerations that could enhance the design for cyclists. The renderings of the full build out scenario show the bike lane and pedestrian space as a shared space with only paint and a different paving style separating bikes and pedestrians. This could cause conflicts with pedestrians wandering into the bike lane. Bicycles are capable of moving very fast and, like other roadway users, some cyclists do not always show the best judgement. A crash between a cyclist and and pedestrian can be just as deadly as between a pedestrian and a car. Separating bicycles and pedestrians with a curb and a different paving would help keep pedestrians from accidentally stepping into the bike lane. The proposed design forces all cyclists to do a two stage turn (also known as a Copenhagen turn) at unsignalized intersections. This means cyclists have to wait for traffic to clear in both directions, whereas typically a cyclist could merge over into the left turn lane and go as soon as traffic in the opposite direction is clear. This makes trips slower for cyclists by forcing them to wait twice, and results in a system that still prioritizes cars over cyclists. It also requires cyclists to turn sharply or lift the bike and point it in the new direction, which is especially difficult on a bike loaded down with groceries or with a trailer full of children in the back. Overall, these issues with the two stage turn are relatively minor. The two staged turn enable a design that increases safety (and the perception of safety) for casual cyclists. The two stage turn works toward the greater good of making the majority feel more comfortable. The concept proposes that signalized intersections include a bicycle phase and bike boxes, especially where Grand intersects with other priority bicycle streets. A real concern is the conflict created by cars turning into parking lots in the middle of the block and crossing the bike lane (as pointed out by a KC Rag forum member). I am acutely aware of this problem having been a victim of a “left cross” collision on Main Street, where a car turned into a parking lot mid block and did not see me (even though I was in the center of the lane) because I was blocked from view by cars in the other lane two lanes. Frankly, this is going to be a problem as long as there are parking lots and curb cuts in the middle of the lane regardless of the type of bicycle infrastructure present. The best solution to this problem is to work with property owners to reduce the number of curb cuts on Grand and ensure future development includes car access via alleyways or the adjacent streets. However, there are a number of elements in this design that make these kinds of collisions less likely. Green paint can be used to highlight where these conflicts exist. 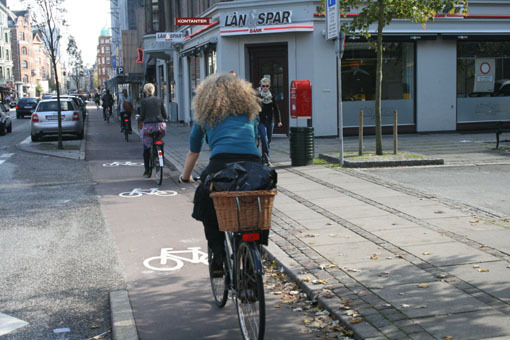 Motorists that have not yet learned to expect bicycles in the roadway are more likely to be on the look out for slower moving road users once they enter the public realm on the other side of the parked cars. Protected bike lanes provide a level of safety and comfort that will increase cycling in our city and provide word class bike infrastructure for this important spine of the KC bike network. It is important to get it right; which is why this site promotes nuanced discussion to ensure our City is the best it can be.